I have been enjoying a few days of post-Christmas quiet and working away on some projects. I didn't want to venture out into the cold and brave the boxing week shoppers to pick up photos, so I decided to work digitally with our recent Christmas pics. I love working with the new, upgraded Storybook Creator 4.0 - there are so many quicker, faster ways to get the results you want, and what a selection of artwork we have to choose from! I decided to submit one of the digital layouts I completed to the December Challenge over at Scrap it With a Song. The challenge was to use your favorite Christmas carol as the inspiration for a layout. 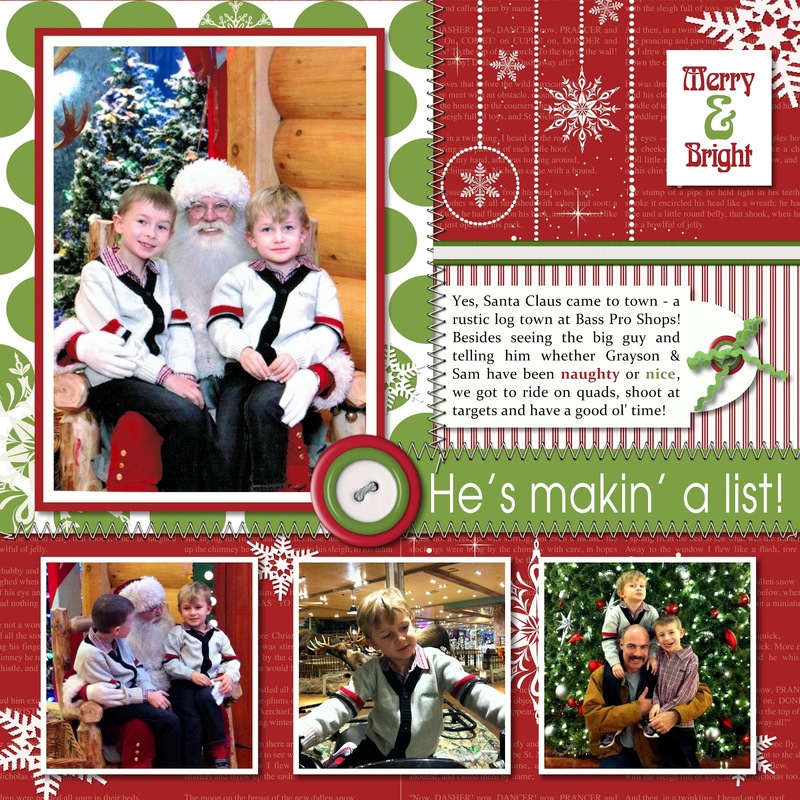 I chose "Santa Claus is Comin' to Town" as the theme for this layout showing Sam and Grayson visiting Santa this year at Bass Pro Shops. I have always loved that Christmas song...especially the quintessential Bing Crosby & Andrew's Sisters version. I remember my mom and dad playing that album every Christmas when I was growing up and I still love that big band sound. The song also has an extra sentimental reason for me now...it's one of the first Christmas songs that Sam has learned to sing, and he does a great rendition despite his severe speech delay. I loved hearing him break into it every time he sees a photo or TV show about Santa! Scrap it With a Song is also having a Design Team call, and after seeing what fun my Calgary Crops colleague Carla has had with this group, I decided to be brave and enter my name for consideration. It's one of my scrappy resolutions for 2013 to "get out there" and submit layouts for publishing and to apply for design teams, so here goes! Yikes! I'll be sharing more of my digital projects as well as my scrappy resolutions in the coming days...see you soon! PS...to parents in the Calgary area - I really recommend going to visit Santa at Bass Pro Shops when he returns next year! It was way less busy than some of the other major malls around Calgary, Santa was wonderful and there was so much fun stuff for the kids to do! We loved it! What a gorgeous layout. I love using my digital scrapbooking. Thanks for joining us at Scrap it with a Song. Good luck on the DT. Fabulous page Noreen! I love the design. All the photos and snowflakes are wonderful. Thanks for playing along at Scrap it with a Song! love how great digi scrapping looks. Love how the page looks stitched together and the song lyrics are just right. This is a beautiful layout! Thanks for joining us at Scrap it With a Song! Fantastic layout Nor! Love the stitching! Thanks for playing along at Scrap it with a Song! !